Disney Is Being Sued Over 'Zootopia'. That's Business As Usual. Disney is being sued for allegedly stealing the idea for Zootopia, which has grossed over $1 billion at the box office and recently netted an Oscar for Best Animated Feature. It's nothing new for the entertainment giant, which has been accused of plagiarism several times in recent years. Gary Goldman, a screenwriter and producer whose credits include Minority Report and Total Recall, claims he pitched the concept for Zootopia to Disney on two occasions, in 2000 and 2009. His lawsuit includes sketches of cartoon animals which, he argues, resemble the film's major characters. He also alleges there are similarities between his proposal and Disney's film, from plot and dialogue to themes such as identity and prejudice, as well as the main setting, an animal-run metropolis. Disney has dismissed the lawsuit as "riddled with patently false allegations" and intends to "vigorously defend" itself in court. 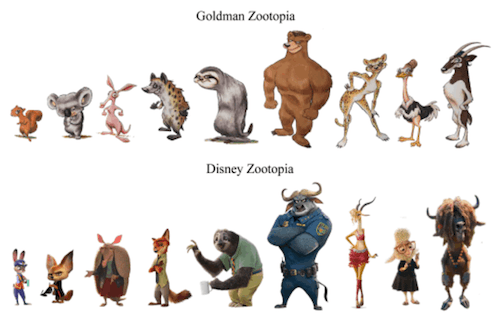 Goldman's lawsuit paints Disney as a repeat offender, arguing Zootopia joins a long list of intellectual properties the company has allegedly ripped off. "They did it with The Lion King when they copied Osamu Tezuka's Kimba The White Lion," it reads. "They did it with Toy Story when they copied Jim Henson's The Christmas Toy. They did it with Monsters, Inc. when they copied Stanley Mouse's Wise G'Eye. They did it with Up when they copied Yannick Banchereau's Above Then Beyond. They did it with the Frozen trailer when they copied Kelly Wilson's The Snowman. And, they did it with Inside Out when they copied Frédéric Mayer's and Cédric Jeanne's Cortex Academy, among other sources." Only two of those examples have resulted in payouts. Illustrator Stanley Mouse sued Disney and Pixar for copyright infringement in Monsters, Inc.; the case was settled out of court for an undisclosed amount. In the Frozen suit, Disney also settled after failing twice to have the case thrown out. Meanwhile, the director of The Lion King has denied knowing about Kimba The White Lion while creating the landmark Disney film. The Christmas Toy was first broadcast on ABC; Disney acquired the TV network in 1995, a few months before Toy Story's release. It appears the main character in Up was created before the release of Above Then Beyond - a film created by French film students - although other similar elements were revealed afterward. And there's little information available on Cortex Academy, a French film released 12 years before Inside Out that also features anthropomorphic emotions manning a control panel inside a person's head. There are plenty of Disney and Pixar films that resemble other properties, but winning a copyright infringement case isn't easy. It requires the plaintiff to prove he or she holds a valid copyright, the defendant had access to the work in question, and the two works are the same or substantially similar. If history is any guide, Goldman could have his work cut out.